Would you like to know a very high probability setup? In the following chart you see a pattern we call AIMS THE Setup. Now you can identify AIMS The Setup using Candle Sticks ONLY. It's a pattern that has, what we call, a Clear 3, followed by a 4 and then AIMS Entry ALERT produces this Red Dot Entry Alert. But we have another way of trading it. Suppose you missed the H1 setup, or you don't trade the H1 time frame. Suppose you can only trade the 5 Minute Time Frame. You can use this Waltz pattern, H1/M5 combination to cherry pick only Very High Probability Setups. 3. Cherry pick only very high probability setups and signals. Second, learn the Waltz Pattern. Rule 2: AIMS Gator is Open and sloping clearly up or down. It is a name given to a price formation. The Waltz pattern is made of 3-5 candles. If you took the Setup 1 pattern and squeezed it into just 2 candles, you'd see this pattern. Wait for at least 1 Strong Impulse Candle then wait for at least 1 consolidation type, small, doji or IB candle. That is your WALTZ pattern. When you see the Waltz pattern drop to m5. Look for Setup 1. 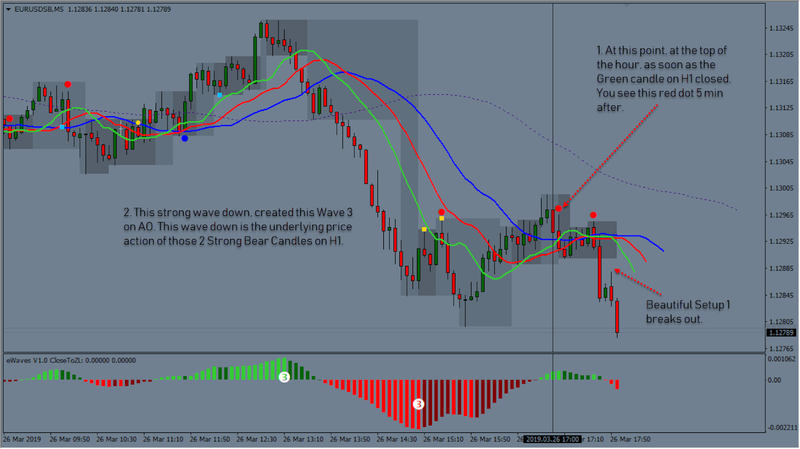 The following two charts shows the Waltz H1/M1 Setup 1 on EUR/USD Today 26th of March 2019. This is a GREAT example of FRACTAL GEOMETRIC Trading. This H1 chart shows a great Setup 1, which you could take on h1. But after the H1 breakout, you could then trade the same pattern when it occurs on M5. Can you see it looks like both pictures might be of the same time frame. But they are not. The second picture. 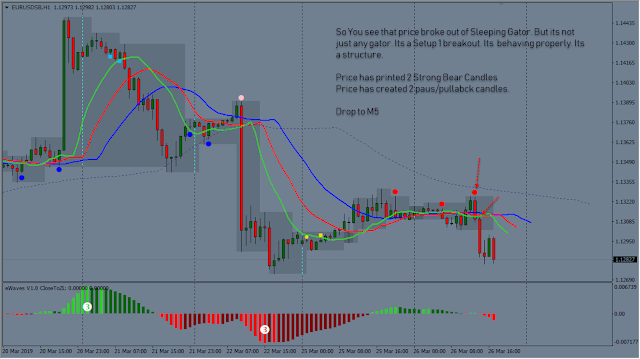 that of M5 time frame, is actually inside the the last 5 candles of the H1 chart. Its Fascinating fractal geometry.